Consumer ratings site honors OneGuard in 2014 for consistently high level of customer service. PHOENIX – (March 9, 2015) – OneGuard Home Warranties earned the service industry’s coveted Angie’s List Super Service Award, reflecting an exemplary year of service provided to members of the local services marketplace and consumer review site in 2014. Founded in 1990, OneGuard Home Warranties is trusted by homeowners in Arizona and Texas to fix major household systems and appliances that break down. Additionally, OneGuard eliminates the stresses of many home maintenance services – such as lawn care, pest control, window washing and HVAC tune-ups – which are not typically covered by home warranty companies. Angie’s List has nearly 3 million users nationwide who utilize the online rating service to identify potential service providers in more than 700 categories. For the last 10 years, home warranty companies have received the greatest percentage of poor scores. In 2014, more than 20 percent of member reviews rated home warranty companies with a “D” or “F.” OneGuard bucked the trend in 2014, consistently achieving a grade “A” more than 75 percent of the time. 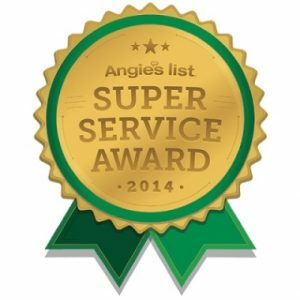 Angie’s List Super Service Award winners must meet strict eligibility requirements, which include an “A” rating in overall grade, recent grade and review period grade. Further, the company must be in good standing with Angie’s List, pass a background check and abide by Angie’s List operational guidelines. To learn more about OneGuard’s home warranty services, visit the company’s website or Angie’s List profile. Founded in 1990, OneGuard Home Warranties is trusted by homeowners in Arizona and Texas to fix major household systems and appliances that break down. Additionally, OneGuard eliminates the stresses of many home maintenance services – such as lawn care, pest control, window washing and HVAC tune-ups – which are not typically covered by home warranty companies. Committed to providing the highest level of customer service, OneGuard maintains a 97-percent customer satisfaction rate. It is the only home warranty company nationwide to earn the Angie’s List Super Service Award and consistently maintain an “A” rating on the consumer review site. For more information, visit www.oneguardhomewarranty.com. Angie’s List helps facilitate happy transactions between nearly 3 million consumers nationwide and its collection of highly rated service providers in 720 categories of service, ranging from home improvement to health care. Built on a foundation of authentic reviews of local service, Angie’s List connects consumers directly to its online marketplace of services from member-reviewed providers, and offers unique tools and support designed to improve the local service experience for both consumers and service professionals. To learn more, visit www.angieslist.com.